of the village of Metung overlooking Bancroft Bay. 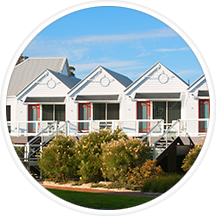 Browse through our unique accommodation to find a room that suits you. Waterfront, spacious Two and Three Bedroom Apartments each on one level with two bathrooms. 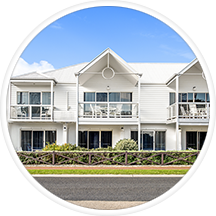 The One Bedroom and Family Apartments face Metung Road and do not have water views. Spacious Luxury Motels and Suites facing Metung Road. The Suites have elevated views toward Lake King. 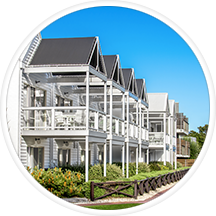 These two storey apartments face Metung Road and have elevated views toward Lake King. 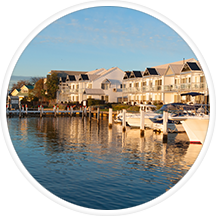 The ‘Moorings at Metung’ gift voucher is the perfect present! Perfect for Mother’s Day, Birthdays, Anniversaries, Christmas and wedding presents. Book instantly, with our secure booking system.